International Journal of Research in Health Sciences,2015,3,1,146-149. 1-Associate Professor, Department of Community Medicine, Osmania Medical College, Hyderabad, Telangana, INDIA. 2-Assistant Professor, Department of Community Medicine, Kakatiya Medical College, Warangal, Telangana, INDIA. Introduction: World Health Organization defines road traffic injury (RTI) as a fatal or nonfatal injury incurred as a result of a collision on a public road involving at least one moving vehicle and pedestrians. Accident has been defined as an unexpected, unplanned occurrence, which involves injury. Road accident is treated as a major epidemic of noncommunicable disease in the present century. Objectives: To assess the prevalence of road traffic cases coming to hospital and to know the various epidemiological factors related to road traffic accident cases. Materials and Methods:This study was conducted at Osmania General Hospital, Hyderabad, Telangana South India from 1st January to 31st December 2013. The study group-consisted of all the RTA victims reporting to casualty in the above one year period. Results: A total of 1158 RTA cases reported at Osmania General Hospital during study period. Out of 1158 RTA cases 1026 (88.6%) of the victims were males & rest 132 (11.4%) were female. The highest number of victims 601(51.8%) were from 16 – 30 years of age group. Followed by 291 (25.1%) in the age group 31 – 45 years. 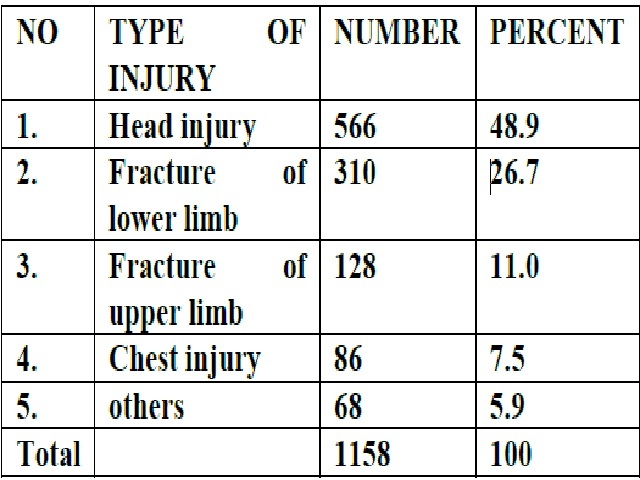 Motorized two-wheeler occupants were highest in number i.e. 898 (77.5%) followed by occupants of four wheelers 147 (12.6%). Pedestrians involved were 82 (7%). Being knocked down was the common mode of RTA, involving 502 victims (43.3%), followed by falling off vehicles which claimed 241(20.8%) victims. Other modes were collision between two vehicles (18.8%), run over (5.9%) and due to overturning (7.0%). Interestingly 130(11.2%) victims were injured due to the vehicle hitting a stationary object (parked vehicle). In the present study it was observed that time factor (To reach hospital) is very crucial for increase the chance of survival among RTA victims, death rate significantly low 7% among those who reached within 30minutes in comparison to those who took more time to reach the hospital. Majority (89%) did not use any safety measures. Only 3% used car seat belt and 8% wear helmet. The effect of alcohol was evident with 62 % were consumed alcohol. Conclusion: It was found that greater portion of the RTA occurred due to collusion between two vehicles followed by defective road. A significant number of accidents took place during bad weather. More than half of the accidents occurred due to wrong side driving.